Payment Plans Available!See website options below. Serving businesses large and small, both in and out of the travel industry, with a special focus on destination and bed and breakfast website design. 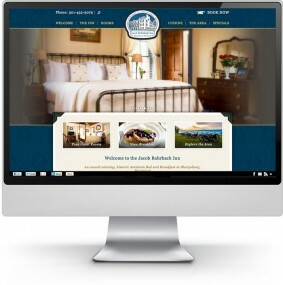 Having a focus on the travel & hospitality industries that began with bed and breakfast website design has enabled us to concentrate on the specific needs, growing our skills to help you grow your business. 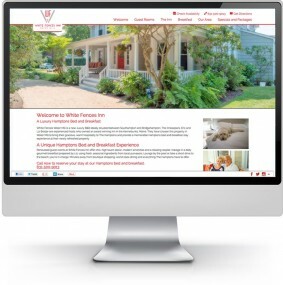 First impressions are lasting impressions, let us help you make the right impression with a beautifully designed website. Beyond beautiful, our websites follow up-to-date design and development standards including responsive design, WordPress and HTML5. Google holds nearly 70% of search market share, so when Google talks, we listen. Google states that responsive web design (RWD) is its recommended mobile configuration and an industry best practice. Google prefers RWD because content that lives on one website and one URL is much easier for users to share, interact with, and link to than content that lives on a separate mobile site. It also makes managing your site and SEO easier, as you have one site to maintain and market. 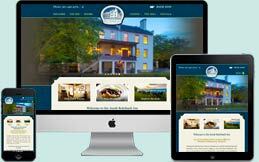 For these reasons, all websites by InsideOut are responsively designed. The process starts with our lead web designer, Beth Edwards, reaching out to talk about your business. The goal is to figure out your style, desires and ideas, and then deliver more than you expected. Beth really believes in the importance of capturing the unique personality of every business and delivering it into custom designed sites. After your feedback, text and images are collected, Beth sets to work laying out the site and then shares the design with you. Changes are made accordingly based upon your feedback, and once you LOVE the design, she proceeds with filling out each page of your new site, sharing progress and collecting feedback along the way. Time frame for a custom site (once materials are received) is 7-10 weeks. Ideal for smaller budgets, our concept themed sites are pre-coded Wordpress themes designed by InsideOut Solutions. You'll work with Jack Waknitz, he collects your logos, photos, text, colors and design ideas and adds them to the theme to create a beautiful site that is unique to your business. Time frame for a concept site (once materials are received) is 3-6 weeks. HTML5 is the latest version of HTML which addresses modern needs and expectations of websites, making them load faster and enhancing user experience. Most of all HTML5 is mobile friendly, allowing developers to create sites that work seamlessly from desktop to smartphone. And what better platform to implement this awesome new code than Wordpress? Wordpress allows us to hand the keys to a shiny new website over to the owner (we're always here to help), which allows website owners the freedom and flexibility to edit their website whenever they want within an easy to use interface.